Mentored by painters Allen Kupeta and Helen Lieros in Zimbabwe, Richard Mudariki moved to Cape Town in 2011 and has steadily achieved prominence despite shunning the neo-expressionist theatricality associated with recent Zimbabwean painting. In 2018 he completed a two-month residency at the Zeitz Museum of Contemporary Art Africa, where his work also featured on the survey exhibition, Five Bhobh: Painting at the End of an Era. 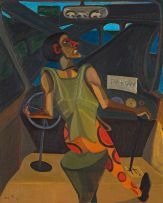 An allegorical painter interested in recording the temperament of his times, Mudariki’s figurative paintings liberally quote from art history while referencing contemporary politics. This lot dates from a period when he reinterpreted works by Géricault and Goya, using techniques redolent of Ben Enwonwu and Zwelethu Mthethwa, to comment on current predicaments. It records an unspectacular scene translated from life: the artist’s passage by bus into the city from his home in Parow. A companion work, From Town to Table View (2013), describes the behaviour of passengers on the bus.